VIII WAS MONTANISM A HERESY? I started this study on Montanus as part of the studies on early heresies. To my surprise it turned out to be study on the development of the waves of movement of the Holy Spirit through history. When the unexpected happens, often we are lost. Yet who are we to judge the Holy Spirit? How do we know whether these strange behavior of people and strange unbelievable claims of miracles are from God or from the devil. This was the problem through the ages. In the case of Montanus, the church could not not make up its mind for a long time and finally denounced the movement. Probably it was too soon too early. But it came as a series of bursts in the 19th century onward. Still the reaction is the same. There are some who claim that it is from the Devil itself while others do feel that it is from God. As Wesley put it, our only tests are “the Law and the Testament”. “By their fruits you will know them”. 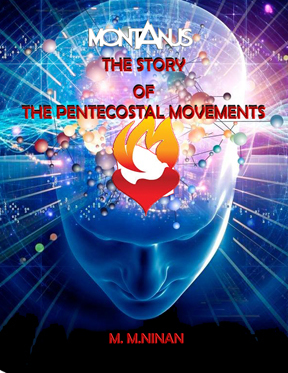 One thing is certain, the Pentecostalism and the Charismatic movements are here to stay. How about the third wave? Judge for yourself.